PM Modi today visited the Mahaveer Philippine Foundation Inc. (MPFI) in Manila. 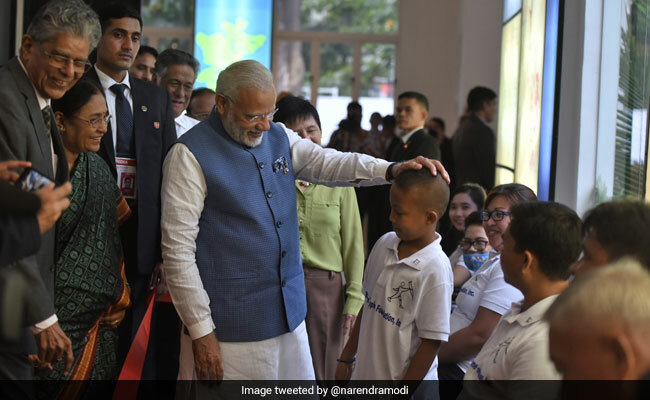 Manila: Nine-year-old Carlo Migel Silvano wants to be a policeman, he told Prime Minister Narendra Modi, who is in Philippines for the ongoing ASEAN summit. He is among the thousands of Filipinos fitted with the Jaipur Foot, a rubber-based prosthetic leg for people with below-knee amputations. PM Modi was at the Mahaveer Philippine Foundation Inc. (MPFI) -- a humanitarian collaboration between India and Philippines -- in Manila, where he interacted with Carlo and others like him. "Their efforts of fitting the Jaipur Foot on needy amputees have touched several lives. During my visit, saw a series of exhibits and interacted with amputees," PM Modi said in another tweet and called it a "wonderful visit". The Mahaveer Philippine Foundation is an associate centre of Jaipur-based Bhagwan Mahaveer Viklang Sahayata Samiti which has helped rehabilitate over 1.55 million differently abled people through Jaipur Foot, and provides free Indian-made prosthesis to amputees there. This year, 757 amputees have benefitted from the programme. "Since its establishment in 1989, the MPFI has fitted nearly 15,000 amputees in the Philippines with Jaipur Foot making them capable of living a new life," PM Modi said and also mentioned that the Indian government made "a modest contribution" to the foundation to support its humanitarian activities. PM Modi arrived in Manila yesterday on a three-day visit to attend the India-ASEAN Summit, the 12th East Asia Summit and a bilateral with President Rodrigo Dutertethe. This year marks the 25th year of the India-Asean dialogue partnership and the golden jubilee of the formation of the Asean regional bloc.